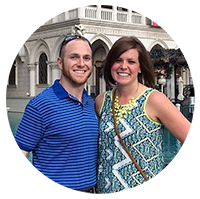 My version of the High Low Project on HGTV. I have been in love with the Lucite trays with the monogram for a while now. I haven’t gotten one because spending upwards of $50 on a tray would be very hard to swing by the hubby. I was greeted with a free afternoon and decided to spend a little bit of time perusing the Container Store. Oh man could I have blown my whole monthly shopping budget at that store. I digress. The Container Store had these really pretty clear Lucite containers for only $9.99. Knowing that the bulk of the budget for this DIY project would come from purchasing the tray, I was sold. 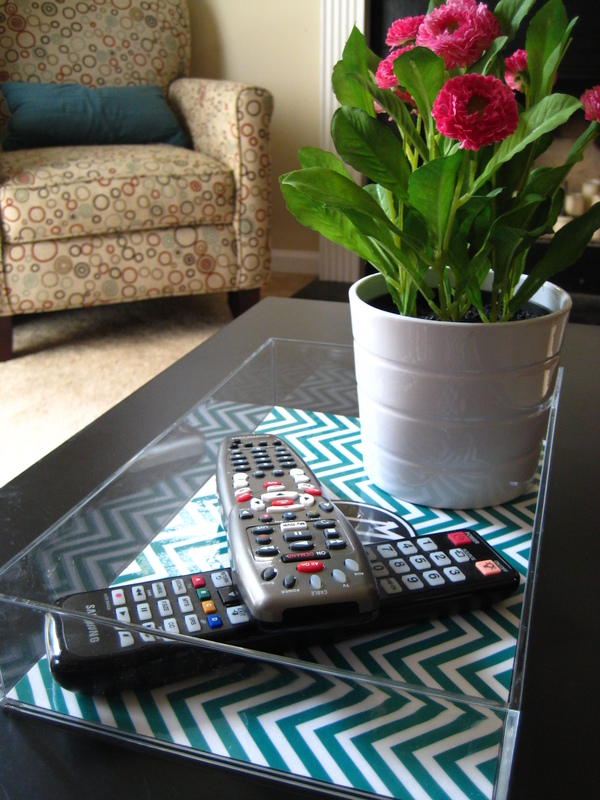 There were cheaper options for colored trays, but I really wanted the clear glass look for my DIY project. Now that I had the tray, I needed to create the patterned bottom. After telling Conner my options of 1) Modpodging the bottom, 2)Using the Cricut to Etch our monogram on the bottom, 3)getting a laminated picture from Staples for $3.00- he told me to go with #3. Reason being- “You could get ones printed for every holiday or occasion and then just switch them out all the time”. Swoon. Man after my own heart. Maybe it is the combination of 4 years dating + 11 months of marriage that makes him know me so well or the fact that every other week I am asking him to help me move a piece of furniture or he comes home to a newly decorated mantle. Haha I bet he didn’t know he was signing up for this madness when we started this journey back in 2007. Here is the finished project in all its remote holding glory. 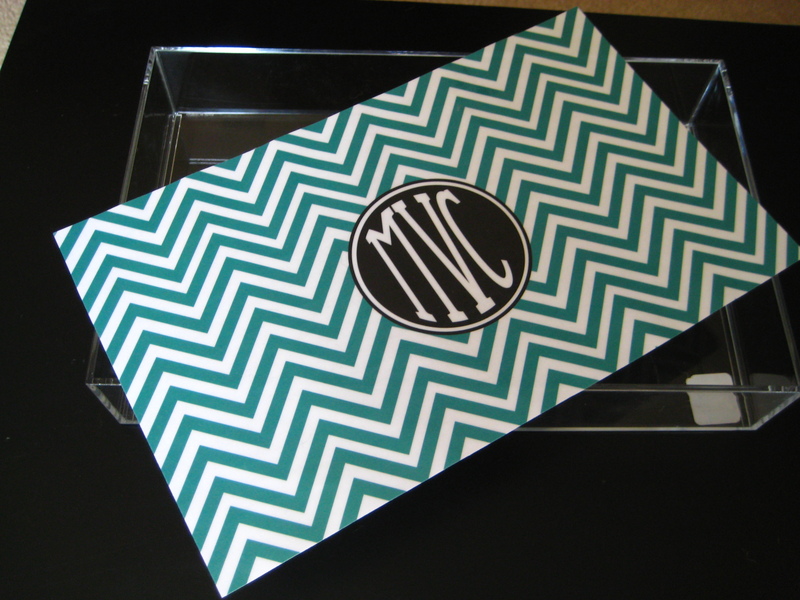 This entry was posted in DIY Projects and tagged crafts, diy, lucite tray, monogrammed. Bookmark the permalink. Very Nice! and way more affordable than the others! Great job, Mandy! I love the monogram you went with. I’m glad I could inspire you with my tutorial. What size did you have to print your paper? and how did you make your monogram?